↑ ملفوظات شاہ عبد العزیز، صفحہ 54، میرٹھ، 1314 ہجری، 1896۔1896. ↑ علامہ عبد الحئی بن فخر الدین،"نزهة الخواطر وبهجة المسامع والنواظر"، جلد 7، شمارہ 713، "الشیخ قمر الدین دہلوی"- دار ابن حزم، بیروت، لبنان، 1999. ↑ Barbara Metcalf, "Islamic revival in British India: Deoband, 1860-1900", pp. 46-86, Princeton university Press. ↑ Government Gazetteer of the United Provinces, Extraordinary (Lucknow, 1938), GAD No. 113/1939, UPSA, page 2-4. ↑ Mushirul Hasan,"Traditional Rites and Contested Meanings: Sectarian Strife in Colonial Lucknow", Economic and Political Weekly, Vol. 31, No. 9 (Mar. 2, 1996), pp. 543-550. ↑ Jasbir Singh to G. M. Harper, 22 Feb 1939, Political Department No. 65/1939, UPSA. ↑ Jasbir Singh to G. M. Harper, 15 and 18 April 1939, Political Department No. 65/1939, UPSA. ↑ Abul Hassan Isphani, "Quaid e Azam Jinnah, as I Knew Him", Forward Publications Trust Karachi (1967). ↑ N. Hollister, " The Shia of India", p-178, Luzac and Company Ltd, London (1953). ↑ The Statesman, Delhi Edition, 21 February 1940. ↑ Liaqat H. Merchant, “Jinnah: A Judicial Verdict”, East and West Publishing Company, Karachi (1990). ↑ Jinnah Papers, second series, volume XI (1 August 1944-31 July 1945); page 174. ↑ آپ کا پہلا جنازہ گورنر ہاؤس میں شیعہ طریقے پر ہوا، آپ کی جائداد بھی محترمہ فاطمہ جناح کو شیعہ طریقے پر منتقل کی گئی، تفصیل اس کتاب میں: Khalid Ahmed, "Sectarian War: Pakistan's Sunni-Shia Violence and its links to the Middle East"، Oxford University Press, 2011. ^ ا ب Andreas Rieck, "The Shias of Pakistan: An Assertive and Beleaguered Minority"، Oxford University Press, (2015). ↑ Mohammad Ayub Khan, "Diaries of Field Marshal Mohammad Ayub Khan",9 July 1967 and 11 July 1967, Oxford University Press, 2008. 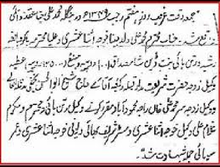 ↑ احسان الہی ظہیر، "الشیعہ و اہل بیت"
↑ علامہ محمد حسین برستی، "خمینیت اور شیعیت میں فرق"